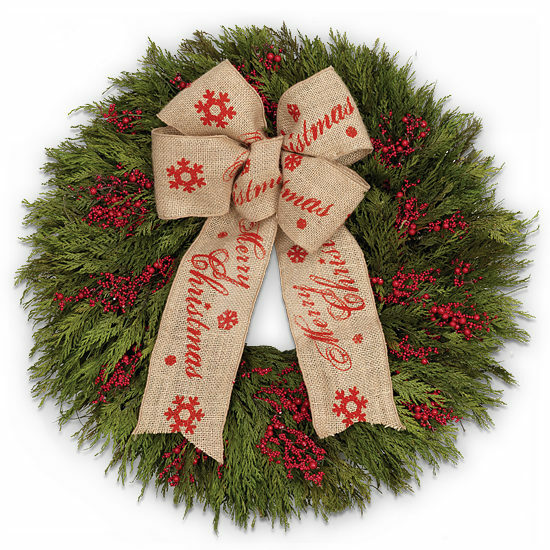 Designed with fragrant preserved cedar and faux red berries, this fun and festive wreath is an ideal holiday gift for anyone, including yourself! This woodland-inspired beauty reflects an appreciation for natural and simplistic things, and its impressive 22″ diameter makes it quite a showpiece for entryway, door, or mantle. A flourish of burlap ribbon printed with red snowflakes and “Merry Christmas” adds a final touch of merriment and an apt greeting for the season.